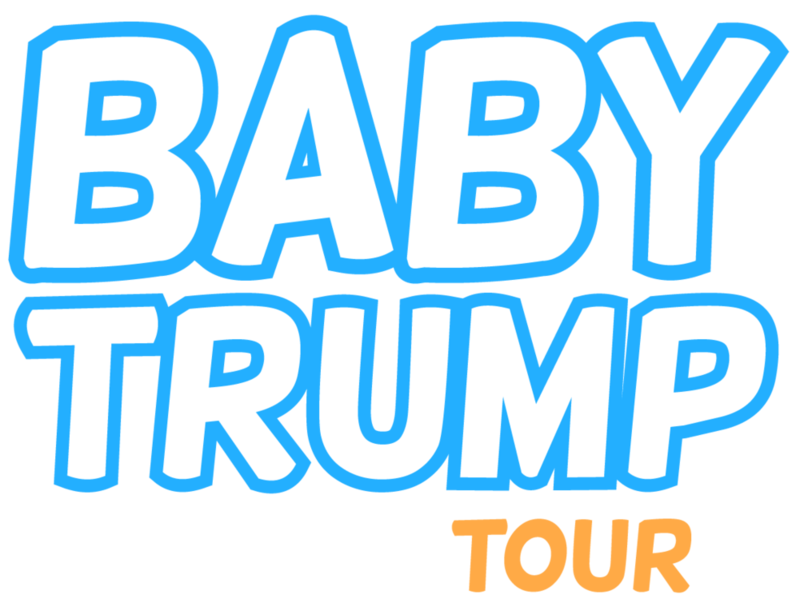 What is the Baby Trump Tour? his administration. The People’s Motorcade will join with organizations across the globe bringing our Baby Trump balloons to events and locations for the purpose of exposing the Baby in the Oval Office for the petulant child that he is. The Baby Trump Tour will continue until our Liar-in-Chief is out of office. Why did we create the Baby Trump Tour? Donald Trump’s words and actions show him to be the greatest threat to democracy we have ever encountered, but Trump himself is a hollow weakling with a fragile ego. His attacks on women, immigrants, minorities, religion, children and families, our justice system, intelligence agencies, environment, healthcare, rule of law, and the Constitution that frames our great country, are unacceptable! Baby Trump is our way of rejecting him and all he represents. The Baby Trump Tour, with your help and participation, will deliver that rejection to cities across the country. There are currently six Baby Trump balloons participating in our Tour. Our original goal was to raise enough money to bring at least one balloon to the United States. However, based on the incredible response to the GoFundMe campaign we decided it was only right to produce as many as we could. The people had spoken. They wanted babies! How big are the balloons? Each balloon is 20 high by 13 feet wide and holds just under 1200 cubic feet of gas. Helium, the same gas used in birthday balloons. We fill our big Babies with air and just enough helium to make them float. Unlike hydrogen, helium is safe, but very expensive. It can cost up to $1,000 to fully inflate one of our balloons. Whether the Babies take flight is up to the event organizer. They can sit on the ground with a minimal amount of helium or elevated by using more helium. A guidance document prepared by our team of experienced balloon handlers will be made available to all adopting parents. Are they like the balloons I see at the Macy’s Thanksgiving Day parade? They float in a similar way to those balloons and can be ‘walked’ for short distances. In most cases it is recommended that they be securely moored to the ground. This is a common requirement of the FAA and local authorities. Upcoming dates and locations will be posted on this site as they are scheduled. Check back frequently for updates. You can also like us on Facebook and/or follow us on Twitter or Instagram. How do I get a Baby Trump Balloon in my city? Can I volunteer for an event? Baby Trump Tour needs passionate people who can help us get these balloons into every state across the country. If you’d like to help, please fill out our Contact & Help form. Shipping and handling these balloons isn’t cheap. Neither is helium. Add in location rental, security, and insurance and before you know it, you’re in for a big ticket. You can help us defray these expenses by donating to get our cool Tour Swag or simply Donate to the cause. All donations will go to support our operations; our organization is entirely volunteer. Don’t see your question answered? Please fill out our Contact & Help form and we’ll get back to you.